As analytics and Big Data have been embraced, analysts are working to become better at communicating the insights from complex analysis. This makes the use of visual analytics increasingly important as a tool to tell compelling stories and to engage decision makers in dialogue. Importantly, the best visual analytics are not necessarily the coolest, most sophisticated, or most complex. 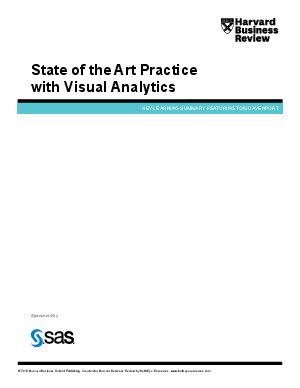 Visual analytics are most effective when there is a clear purpose and when data can be visualized and communicated in a way that is easily understandable.